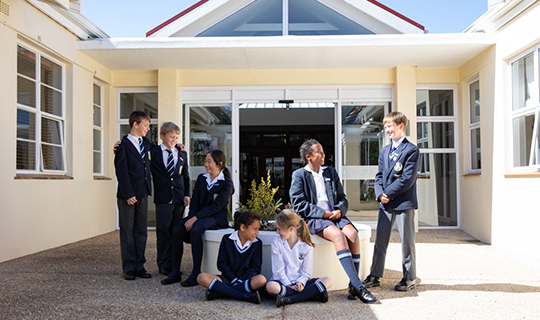 During the fourth term, prospective prefects from Grade 6, address the pupils from Grades 4 to 7. They introduce themselves and deliver a speech where they point out why they think they should have a leadership role. Pupils from Grades 5, 6 and 7 vote for 15 candidates. The Grade 6 teachers give the staff a deeper insight into these prospective prefects. The staff vote and a shortlist of names is drawn up. After much discussion by all teachers, who teach these children, as well as the Grade 7 teachers, the prefects are chosen and announced at Prize Giving where they read a pledge, and receive their sashes and badges. During the following year, more prefects are chosen and at the end of Term 2, the Head Prefects and Deputy Head Prefects are announced. This group of leaders attend a Leadership Camp, present assemblies, entertain the aged and collect ingredients and help at the Christmas Pudding Mix. They also help around the school by doing various duties before school and during break. At the end of the year, they take prospective parents on a tour around the school and at the end of year Prize Giving, they hand over their sashes to the incoming prefects wishing them well on their journey of leadership. Being a prefect is an honourable role and good leadership qualities can be learnt and enhanced during this time.